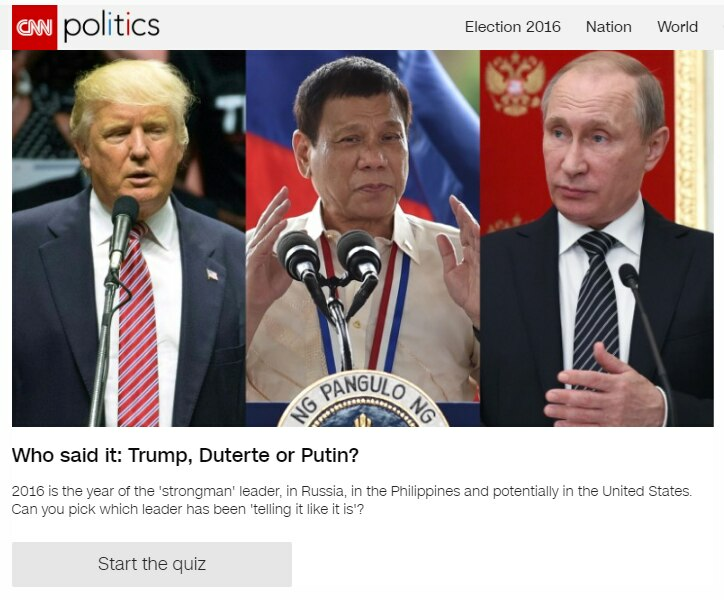 Duterte featured in CNN:Trump, Putin or Duterte: Can you pick which politician said what? thailand dating President Rodrigo Duterte has been featured in international news network CNN’s “Who said it” quiz, alongside Russian President Vladimir Putin and U.S. presidential candidate Donald Trump. Odder It’s been a good year for blunt, fiercely macho leadership around the world. Sundsvall Controversial Philippines President Rodrigo Duterte was elected in June, Republican Presidential nominee Donald Trump beat all expectations to end up just one step from the White House andRussian President Vladimir Putin continued to consolidate his power. Obama cancels meeting with Duterte.